Just My Garden: Thai Basil? Can somebody identify this Basil for me? It is a very small plant, say 6 inches tall and has a shrub-like appearance. The leaves are aromatic. It flowered some time back, probably because I did not prune it - the purplish cluster is the start of the inflorescence which has white flowers. I have some seeds also, which are very small and black. For anybody who can help with a positive identification, thanks in advance. How can I use it in my cooking? You had left a comment on my blog regarding your Thai Basil. 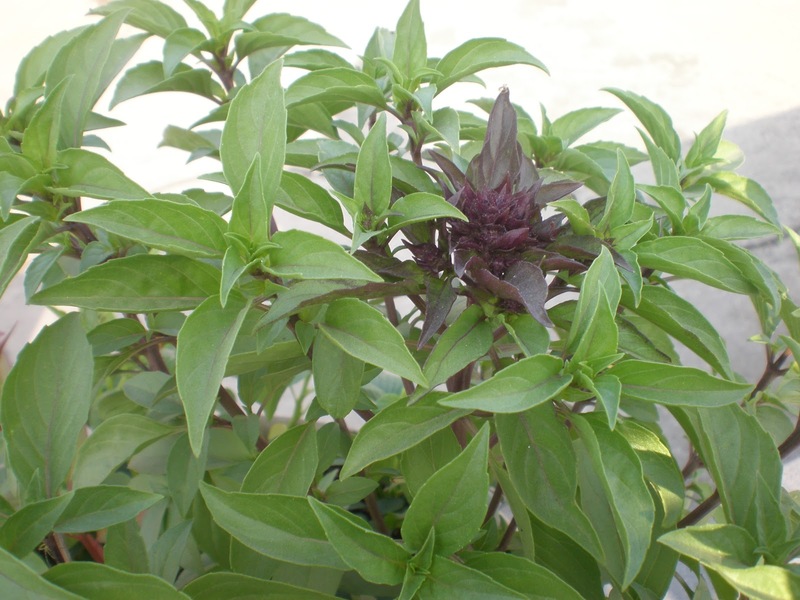 You can use the leaves in a variety of Asian curries and it has a lot of medicinal qualities too. It helps you get rid of headache quickly. Regarding its seeds, the seeds grow in pods like that of Tulsi. The seeds are tiny and the germination rate is quiet good too. You can dry them on the plant and store them for next generation corps.